The toilet is an important commodity we have to use every day. You must know that toilet seat designed for an adult is not suitable for children. 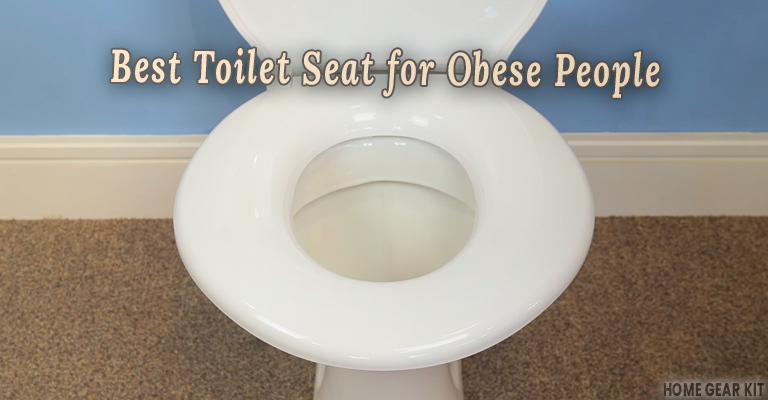 In the same way, a toilet seat that is used by slim people is not suitable for obese people. So, specially designed toilet seat for obese people has been manufactured. If an obese person uses a standard size toilet seat continuously, the toilet seat will not last long because each toilet seat has the limited load-bearing capacity and the pressure of extra load will decrease its lifetime. There are varieties of toilet seats with different load-bearing capacities for obese people. You will find a collection of some high quality and popular toilet seats for obese people in this article and can choose the most suitable one for purchase from the list. Big John has great popularity for manufacturing high-quality toilet seats for obese people. The white toilet seat is made of strong ABS plastic material and delivered to the customers with all the necessary installing material including an instruction manual. The hinges provided with the toilet seat is made of stainless steel and the surface of the seat is spacious and stable. It can withstand over 1200lbs weight. It shows good resistance against stain and so you do not have to spend extra time cleaning the stain. It also shows good resistance against chemical attack. It is a durable product and looks new even after using for a long time. The rubber bumper is included in this unit to eliminate the annoying noise of slamming shut of the lid. It also helps to keep the seat stable. The Big John 1-W Oversized Toilet Seat has been marketed only for obese people but it has another important advantage you will be happy to know. It is a suitable toilet seat for physically challenged people also. So, it can also be used in hospital and health care facilities besides residential use. The designers designed this Big John 1-W to fit in any round or elongated shaped toilet seat. Though it is easy to install some finds it difficult to install, in that case, you can take help of a professional. Ergonomic design, larger and luxurious sitting, stability, great load-bearing capacity, and easy installation are the key features of Big John 3-W Oversized Open Front Toilet Seat. This 3-W model of Big-John has a great similarity with the previous model 1-W except for the design and load-bearing capacity. The front part of Big John 3-W has open front is open whereas the front part of the 1-W model has a complete circular contour. Sturdy plastic has been used to manufacture this product. Hinges of stainless steel add extra strength to the unit. So, they do not bend easily like plastic hinges. The wide sitting surface of Big-John 3-W model can bear more than 1200 pound weight. To prevent any kind of wiggling and to ensure the stability of the seat rubber with good anti-slip property has been used in the base. It uses a universal fit that has made it able to be fitted with a both elongated and round shaped toilet. It is engineered to install easily within a short time. You just need a simple wrench or pliers. If you have little expertise you will not need more than half an hour. But, if you feel it difficult to do, then we will recommend you to take expert’s help. Except for the overweight people, people with a disability or physical illness can also use it. It is one of the most user-friendly toilet seats you will ever find in the market. Unlike other Big John product, Big John Sx-0406964 1200Lb Toilet Seat comes without any lid. It is considered one of the best toilet seats for commercial use. It is giant in size and it may seem to you an incomplete part but that is not right. It is a complete toilet seat for giant buttock. So, keep an eye on your kids so that they cannot try to try it out. The plastic used to manufacture this Sx-0406964 model is very sturdy and can withstand 1200lbs. Like all other Big John toilet seats, this model also uses stainless steel hinges. So, there is no chance of getting rust due to the contact of moisture and also, they do not bend due to continuous use like plastic hinges. A common problem of the toilet seat used by obese people is gliding. To ensure the stability plastic bumpers have been used at the bottom part of the toilet seat. Since Big John uses universal fitting in their product you do not have to think about your existed toilet seat. You can install it on the both elongated and round shaped toilet seat. The ergonomic design of Big John Sx-0406964 1200Lb Toilet Seat protects your backache from getting hurt. If you are extremely overweight this can be a perfect choice for you. Bemis 7800TDG000 Heavy Duty Toilet Seat is a premium quality product designed for elongated shaped toilet seat such as- Kohler, American Standard, TOTO and many more. The injection molded solid plastic with non-corrosive stainless steel post has made this a durable product. The nicely contoured seat with a closed front and fold down lid has a good load-bearing capacity. It uses the latest STA-TITE fastening system. You can install it with a snap. There are total 4 both bumpers on both the lid and the sit. If you install it on your toilet you do not have face any problem of wiggling or loosening. Ensuring hygiene is the most important thing for toilet accessories. Bemis has been added the Duraguard feature in their product which provides protection from microbial agents. Cleaning and maintaining of Bemis 7800TDG000 Heavy Duty Toilet Seat are very easy and not time-consuming. Its color is such that it blends with the color of your toilet very nicely if your toilet is white in color. The aesthetic beauty of this product is really eye-soothing. You can use it in residential places, office or hospitals. This heavy-duty toilet seat is not so costly. You can afford it even with a narrow budget. American Standard is a renowned toilet accessory manufacturer who has a great reputation for manufacturing high-quality product with the latest engineering features and ergonomic design. They have made the American Standard 5905.100.020 Extra Heavy-Duty toilet seat is manufactured especially for rigorous commercial use. This specially designed toilet seat has been made using strong and sturdy polypropylene plastic. So, there is no doubt that this toilet seat can withstand a great weight. Though the manufacturing material is very strong it is not uncomfortable to use. Since it is made for commercial purpose lid or cover is not included with it. Because most people do not like lid or cover on the toilet of commercial or public space. If you notice you will find that 5 out of 3 homes in America and so many hotels, airports, stadium etc. are using toilet seat made by American standard. Its white color easily blends with the environment of your toilet. Its front part is elongated in shape and so you can install it on any standard toilet seat of elongated shape. You can install it easily. Its strong hinges are a great factor in its long life. It does not break down or damages because of bearing high load on a continual basis. Using normal toilet seats for obese people is not good at all. Such practice not only lessens the lifetime of the product but also causes many serious physical problems to the obese user such as –back pain. We spend pretty much time in the toilet every day. So, no one should ignore the importance of choosing the right toilet seat that is compatible with their body shape and size. The most popular and top-ranked heavy duty toilet seats for obese people are listed in this article. You can easily pick up the best one for you from this list spending a little time.